Sunday's WC Final between España & Nederland will be more than two great nations fighting for the world's greatest trophy - they will battle to take their country to new heights. First WC played in Africa. First time a European team will win outside Europe. And the first time Spain & Netherlands meet in a WC. 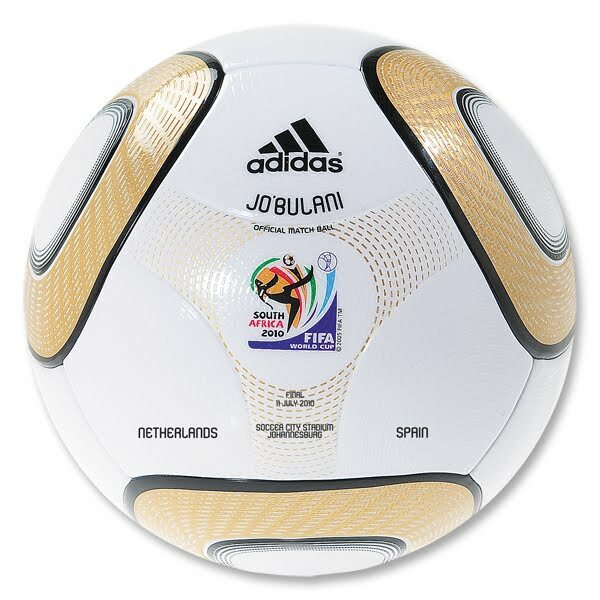 The ball that will be used in the Final match between Netherlands & Spain of 2010 FIFA World Cup. Printed with the competing teams, the stadium, the date and the match number. adidas' Jo'bulani is the Official Match Ball for the 2010 FIFA World Cup Final in South Africa. 365 Inc is the only place you'll find this ball stateside. Teams will be playing with balls with these graphics during the match. Meant to be a collectors item. Graphics are not meant to hold up under long-term play. Constructed with eight new thermally-bonded, spherically-shaped, 3-D EVA and TPU panels, the Jo'bulani is perfectly round and has been equipped with a new Grip'n'Groove technology that ensures it flies straight and true. The Jo'bulani is designed for never-before-seen power, swerve and control. It's a ball truly worthy of the best in the game! The Cover - Thermally-bonded PU for exceptionally true and straight flight. The Bladder - Latex for excellent rebound. FIFA approved.